What’s one of the most fun aspects of Easter? Easter egg hunts, of course! And while the hunts themselves are fun enough, you’re still not done once you find all the eggs, because then you’ve got the candy inside them to enjoy! 1) Jelly Belly Smoothie Mix. These are the jelly beans pictured above. They come in a 10-pound box and feature deliciously sugary smoothie flavors. With that amount of jelly beans, you have enough to fill up a bunch of Easter eggs and still have a lot left over for Easter candy buffets and candy baskets. You won’t regret checking out these smoothie jelly bean flavors, trust us. 2) Jumbo Cinnamon Jelly Beans. These gigantic cinnamon-flavored jelly beans are bold red and really never get old. Delicious cinnamon flavor is strong in every single bean, and you owe it to your friends and family to include these in any Easter egg hunt you’re having this season. 3) Jolly Rancher Jelly Beans. A little untraditional but still magnificently delicious, Jolly Rancher bulk jelly beans come in numerous fruity flavors, including watermelon, strawberry, orange, grape, apple, and blue raspberry. Oh, these are mouthwatering. Any of these delicious jelly bean options would make great Easter egg hunt candy this spring. 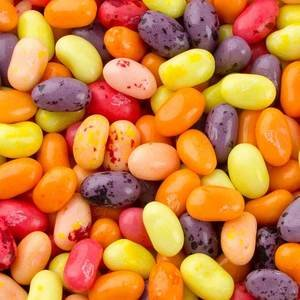 Come pick up yours bulk jelly beans right now from BlairCandy.com!